If you are like me, then sometimes you might have a hard time communicating with your parents. Do they know Spanish? If you are having a hard time communicating with them in English, perhaps you should switch languages on them. If nothing else, they will be impressed with your Spanish. They might also be annoyed, but you can use this opportunity to teach them a little Spanish or even play a little joke on them. Please practice what you learn in the video and on our Facebook page. By practicing on our Facebook page, you automatically enter yourself to win free software from us here at Visual Link Spanish. I didn’t do it. No lo hice. It’s not my fault. No tengo la culpa. He did it. El lo hizo. She did it. Ella lo hizo. Are we there yet? ¿Ya llegamos? Thank you for helping me. Gracias por ayudarme. Give me a hug. Dame un abrazo. I’m home and I’m safe. Estoy en casa y estoy seguro. What would you like to tell your parents? Please practice these Spanish phrases with your parents, and please practice what you’ve learned and answer those questions on the Visual Link Spanish Facebook page for a chance to win free software from us. ¡Hola Amigos! Here are some fun Spanish love phrases you might want to learn to spice up your life a little. If you have a significant other, you can practice these phrases with them. If they don’t know Spanish, you can teach them. If you want to meet someone, these Spanish love phrases may come in handy. You are beautiful (said to a woman) – Tú eres hermosa. You are good looking (said to a man) – Tú eres guapo. Why don’t you write to me? – ¿Por qué no me escribes? I love you passionately – Te amo apasionadamente. Do you love me? – ¿Me quieres? I want to kiss you. – Quiero besarte. I want to hug you. – Quiero abrazarte. I can’t live without you. – No puedo vivir sin ti. Please write soon. – Por favor escribe pronto. Hopefully those Spanish love phrases are enough to get you going and at least help you have a little fun. Remember to keep practicing your Spanish. The more you practice, the better you’ll get! I want to swim. | Quiero nadar. Are there sharks in the water? | ¿Hay tiburones en el agua? Challenge: Visit a beach, practice this vocabulary, and tell me about your experience. 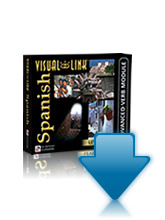 ¡Hola Amigos de Visual Link Spanish! On Wednesdays, I will be answering questions – so come on back then and take a look. Ever since I learned Spanish I have had a crush on Shakira. I am not ashamed to admit that, and there is no reason that I should be. Obviously she is very attractive, and she knows that. Obviously she can move very well, and she knows that. She may not have the best voice in the world, but she has a unique voice and she uses it well. The songs she chooses are very entertaining. She has a pleasing personality as well. Those are some of the reasons that she is such a great entertainer and is so famous. Shakira was born February 2, 1977, in Barranquilla, Colombia, into a poor family. Her mother was a native Colombian, and her father was of Lebanese descent. She grew up listening to music from both cultures. She wrote her first song at age eight, began entering and winning competitions at age ten. She learned the guitar at age 11, and at age 13 she moved to Bogotá to pursue a career in modeling. She wound up signing a record deal with Sony’s Colombian division instead while she was there. And thus began her ascent to fame. Shakira has written or co-written most of her songs. She has always wanted to maintain a control over her songs. When she received an offer from Gloria Estefan to translate her hit song “Ojos Asi” into English, she decided that she would learn English well enough that she would write her own songs in English as well. She has made it huge in English and Spanish because of her unique poetic imagery. Shakira is a great example of learning a second language. She has learned English very well. She had a goal and she dedicated herself to that goal, and look what she has done. Her success is very public because she just happens to be a huge celebrity now. You will experience your own successes should you choose to learn Spanish. I recommend that you listen to some of Shakira’s music in the process. Grab her lyrics and try to sing along. You’ll notice that she sings very fast and that her music can mesmerize you. Beware. I know the title of this week’s video lesson may sound a little controversial – don’t worry, we don’t advocate being mean to children. However, it probably caught your attention and got you to read the title and wonder what the lesson would be about. Anyway, here you are and here’s the lesson. If you have children, these are some useful phrases I have said to my kids in Spanish over the years and they’ve learned them quite well. You can learn them and practice them with your kids also. It’s a great way to give your kids exposure to Spanish. Be sure and listen to the Spanish pronunciation well so you teach them a proper accent. Do you have children? ¿Tienes hijos? How many children do you have? ¿Cuántos hijos tienes? After learning those words, be sure and try them out on your kids or grandkids (if you have either). Please practice what you’ve learned and come answer those questions on Facebook – hope to see you there! If you want to learn Spanish at a higher level, try one of our Free Spanish Downloads. 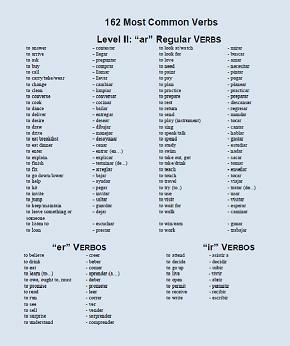 As I was working, a few years ago, with our linguists and software developers to create our Level II Introductory Verb course, I spent hours and hours researching a Spanish Verbs List that we could use in the course that would have the most common Spanish verbs. This Spanish verbs list contains 162 of the most common Spanish verbs. It is organized first by “regular” verbs – “ar”, “er” and “ir” (alphabetically). Then, I’ve categorized them by all the types of irregular verbs in the present tense. I believe we’ve covered every category of irregular verbs in Spanish. The stem-changing verbs have the letters that change underlined with the letters they change into in parenthesis. Finally, the Spanish verbs list contains a great little list of the most common reflexive verbs – both regular and irregular. If you want to try a 7-day trial download of our Level II verbs course, you should be able to learn all the present tense verbs (including irregulars) for free during the 7-day trial (if you push yourself). The software contains classroom-style lessons that teach you all the verbs and conjugations. Not every reason to learn Spanish needs to be serious. Here are a few less serious reasons to learn Spanish that I came up with. I’d love to hear any new non-serious reasons that you can come up with in the blog comments. Act like you don’t know English. Your mustache will be taken more seriously. Increase your chances with Shakira. Automatically become a great dancer. Could you give us the check please? – ¿Podría darnos la cuenta, por favor? We would like to order. – Nos gustaría ordenar. Challenge: Go visit a restaurant where you can practice your Spanish, practice your Spanish, and tell me about your experience. Many of you have wanted a Spanish verb conjugation chart that is small enough to fit into your pocket, yet large enough to cover all the basic Spanish conjugations. Well, here it is. We’ve created it. A Spanish verb conjugation chart that covers all Spanish verb tenses and many irregulars that’s small enough to print and fit into your pocket. Print Your Own Copy – Free! This Spanish Verb Conjugation Chart covers every verb conjugation in the Spanish language (except “Future Subjunctive” which was pretty much only used back in the 16th century or before). It includes: Present, Present Progressive (Doing Verbs), Present Perfect (Have verbs), Preterite (Spine Verbs), Imperfect (Back Verbs), Conditional (Would Verbs), Future (Will Verbs), Imperatives (Commands), Subjunctive and Past Subjunctive conjugations for all verbs. Now, the chart is not all inclusive. It does include many irregular Spanish verbs, however, it does not include all Spanish irregular verbs. To learn how to conjugate the top 320 most common verbs in Spanish – with all their irregulars in all tenses, try downloading a free 7-day trial of one or both of the Visual Link Spanish Verb Conjugation courses below. Some people have asked us why the Introductory Verb Course is called “Level II”. Well, technically it’s the Level I of the verb courses, however, our actual Level I course is a sentence building and conversation course and has nothing to do with verbs. So, if you want to learn verbs, our Level II Introductory Verb Course is the way to go – especially if you’ve never had Spanish before. Go ahead and try it – it’s free for 7 days! Also, remember the Spanish Verb Conjugation Chart is always completely free. You download it and it’s free forever!